Jonny Quest (often referred to as The Adventures of Jonny Quest) was a science fiction/adventure animated television series produced by Hanna-Barbera Productions, and created and designed by comic book artist Doug Wildey, about the adventures of a young boy who accompanies his father on extraordinary adventures. The first of several Hanna-Barbera action-based adventure shows, which would later include Space Ghost, The Herculoids, and Birdman and the Galaxy Trio, Jonny Quest ran on ABC in prime time for one season in 1964 - 1965. 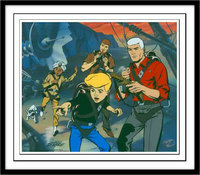 After spending two decades in reruns, new episodes were produced for syndication in 1986, two telefilms and a spin-off series (The Real Adventures of Jonny Quest) later revived the characters for the 1990s.